Rates includes: Unlimited kilometres as per terms and conditions, linen, Free airport pickup and return or office transfers at Gold coast, Brisbane,Cairns and Melbourne by oppointment (for rentals over 5 days), Free consultation and instruction on using your camper, Free extra drivers, Full comprehensive insurance and 24 hr roadside assistance and over 400 repair centers network Australian wide, All taxes. ABOUT THE CAMPER: This vehicle can sleep up to x3 adults inside and x2 in a tent (not provided). It's perfect for a group of friends or Mum, Dad and the kids! See our vehicle description for full specifications and features. Rates includes: Unlimited kilometres as per terms and conditions, linen, Free airport pickup and return or office transfers at Gold coast, Brisbane,Cairns and Melbourne by oppointment (for rentals over 5 days), Free consultation and instruction on using your camper, Free extra drivers, Full comprehensive insurance and 24 hr roadside assistance and over 400 repair centers network Australian wide, All taxes. This vehicle is not a full size motorhome but a compact version that is able to be parked in a regular car space. 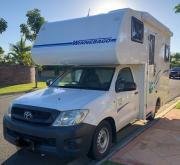 Rates includes: Unlimited kilometres as per terms and conditions, linen, Free airport pickup and return or office transfers at Gold coast, Brisbane,Cairns and Melbourne by oppointment (for rentals over 5 days), Free consultation and instruction on using your camper, Free extra drivers, Full comprehensive insurance and 24 hr roadside assistance and over 400 repair centers network Australian wide, All taxes.